This week we feature another beer from our line-up of Irish craft, and we’re joined by another of our Irish friends, Sarah Finney of 5 Minutes of Finney to review the Black IPA from Blacks of Kinsale. We’re back for another instalment of our Beastie O’Clock series, with another round of special beers from our friends at Harviestoun. This time we have 4 beers – the original Bitter & Twisted, and then 3 variations of B&T aged in Thistley Cross cider barrels with various fruits. 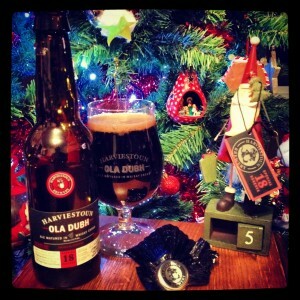 We also have an interview with Amy, head brewer at Harviestoun, on their approach to these beers. Don’t forget to check out Justin Mason’s blogs on the Wee Beastie beers on Get Beer. Drink Beer. Details for the next Wee Beastie event on 19 March can be found here. Former guest on the show and Manchester-based blogger Rowan Molyneux has this to say about the winning beer… Marble has been one of my favourite breweries since I started drinking beer, and when I moved to Manchester I was delighted to be able to drink in Marble’s own pubs. Zingy, pale and fresh, Pint is a stalwart of the Marble range. Full-bodied despite its low ABV, the grapefruit and lemon flavours sing from the glass and its clean, refreshing nature leads you towards ordering another, and another…. To drink this by anything less than, well, the pint, would be an injustice! For me, Pint is the perfect session beer. So we got there in the end! Following the success of the UK Top 10 IPAs and then the disappointment of the ‘vote rigging’ scandal the first time we ran this poll, we now have a result in the Top 10 Lagers. This post is a bit of a mash-up of a number of other posts that I was planning while the show was off the air. Basically, I ran out of time to write all the blogs I wanted to and not wishing to clog up the blogginator, I think I’ve found a way of getting it all down in the one post. The theme of this post is ‘gratitude’ – all of the beers in this post have been sent or given to me, and I am very much appreciative of the generosity that exists within the beer community. It’s a Scottish triple-header this week as not only are we joined by #1 fan, and actual Scottish person, DOODY (aka Michael), but we have TWO (count ’em!) beers from favoured Scottish brewery Harviestoun: The Ridge and Broken Dial. What do our trio of beer reviewers think? That, plus we catch up with how the Sheffield Crawl went (someone had a belly-full of Canonball, we hear…) and more! It’s Beer O’Clock! Here’s your daily catch up from yesterday courtesy of Storify! I’m doing this one ‘live’ today as I drink the beer. Now I’ve gone on record on the show a number of times in the past to rave about both Harviestoun and the Ola Dubh series and this was the reason that this particular bottle earned the honoured place of ‘Xmas Eve Beer’ in the run down. The initial aroma was of smoked cheese (yes, really) and this soon gave way to the dark roasted malt laced with the whisky that this original ‘Old Engine Oil’ has been maturing in. It’s a very dark, viscous liquid that oozes out of the bottle and leaves a wonderfully creamy coloured head. The first mouthful tastes like absolute heaven. It’s thick, warming, roasted, boozy and smooth all at the same time. It leaves a lovely smooth finish and almost no bitterness on the aftertaste – this is such a well balanced beer that you can pair with cheese or chocolate (or both) – as Shaun Voss from Harviestoun proved recently at the event that I attended at The Gun in the Docklands. As it’s warming in the glass, the boozy aroma is becoming more prominent, but if anything the flavour and finish is becoming smoother. This really is a great beer, and I’ve thoroughly enjoyed every occasion I’ve tried it.